Fished the last three days with Jack and Jay... Two brothers from from Colorodo... Great guys and lots of fun..
Fools no.. fun yes.. they managed to get three tarpon to eat a toad fly their first day of salt water fishing..
Day 2..... The wind picked up... fishing got tougher.. we still had some shots at big tarpon, but with the wind blowing the boat down on the fish, our window of oppertunity closed quickly... we did have some fun with smaller sharks on fly out of the wind. Day 3...... We decided to do some thing completly different.. we targeted permit on the gulf edge instead... had several good shots.. had two eats and also bagged a couple of sharks, one that ripped us into the backing with a 12 wt. 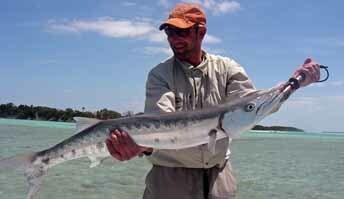 Jay was a lot more comfortable with a fly rod then a spinning rod, but did boat a dandy cuda with a tube lure..